As part of Jupiter Animal Hospital’s wellness program, our veterinarians recommend pet identification microchipping. This simple, painless procedure installs a tiny chip the size of a grain of rice under your pet’s skin, between the shoulder blades. If he or she is ever lost, microchipping provides a safe, effective way to help your pet make it home safely. Once the microchip is inserted, it permanently remains in place and your pet is identified for life. Microchips are safe, unalterable and permanent identification for pets. Jupiter Animal Hospital strongly recommends microchipping all animals. In the event they are separated from you, it may be your only means of being reunited with them. Each tiny microchip is encoded with unique information about your pet. This information is entered into a national database. 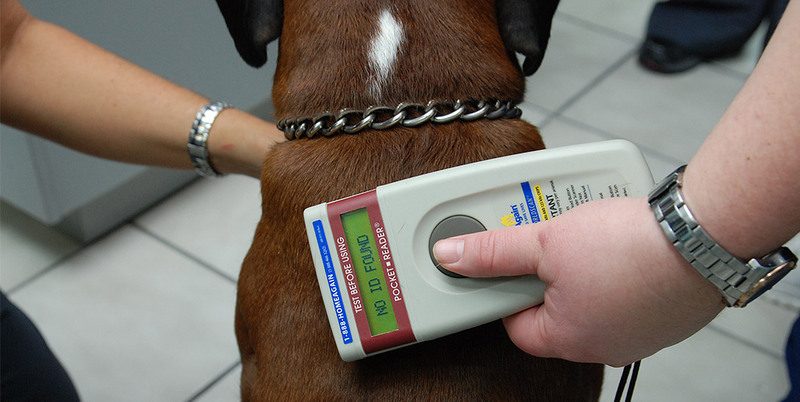 Veterinary hospitals and animal shelters across the country are equipped with special scanners capable of detecting and reading microchips. If your pet is lost, his or her microchip is scanned and the information is used to reunite you and your best friend. You can visit the AVMA’s website and the Home Again website to learn more about some of the most frequently asked questions about microchipping. You can also use the Pet Microchip Lookup web site to find a pet’s owners based on the microchip number, independent of the microchipping company. Please give us a call today to have your pet microchipped. Super-friendly front office staff (Lisa & Crissy) nice doctor (met with Kluge (sp?). They offer affordable vet care and boarding. It is a small office feel which I like, it feels less like a corporate vet or boarding facility and more like a friendly office where you know your pet will receive loving and happy care. Really nice folks working here, they took great care boarding my (sometimes difficult) kitties. They work hard to accommodate your needs and charge reasonable rates! I transplanted to Jup/Tequesta four years ago. Not knowing which way was up, I bounced around from vet to vet until I came across JAH. Can't say enough good things about the place. Caring staff, excellent care, and top notch grooming. Best place in town to bring your critters to. i wont take my lil baby anywhere else, i live out west in the farms and its close to me, but even if he moved 20 miles i would make the drive, he is kind, patient, understanding and handles my unruly baby with care (pomeranian) if you want a loving, kind person to handle your babies, go here, the time he takes to explain things to you is more than comforting, highly reccommend.